Vintage glasses are often confused with retro eyeglasses. Although “vintage” and “retro” sound similar and are two descriptive labels for styles and objects such as eyewear, clothing, and cars, they are very different in their actual meanings. Frames of retro eyewear are recently manufactured with a mixture of design elements that draw on the past, but using current modern technology and components. 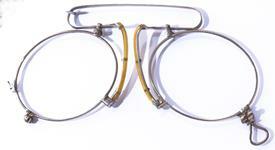 Frames of vintage eyeglasses were actually manufactured in the 1920s, 30s, 40s, 50s, 60s, 70s and 80s. Vintage glasses are regarded as original and authentic. Original vintage prescription glasses are the inspiration for the retro eye glasses characters wear on television shows such as Mad Men which in turn has inspired numerous eyewear manufacturers to create similar frame styles. Some of the manufacturer’s that were popular during the 40s, 50s, 60s, 70s and 80s are still designing eyewear. You can probably find authentic Ray-Ban Clubmaster vintage glasses and at the same time buy a retro Ray-Ban version as well. Aviator vintage glasses were very popular from the 50’s through the 80’s from such manufacturers as Charmant, Ray Ban, or Safilo. Originally worn by pilots in the US air force, vintage aviator eyeglasses have a unique tear-drop shape. Although they were popular in the 60’s- the 80’s, Top Gun in 1986 did more for making aviator glasses popular to a wider audience than any other movie of that era. You can still find vintage glasses in the aviator style today, but it’s probably easier to find on Eyeglasses.com modern day versions. Just type in aviator in our search bar and you will find hundreds of them in both regular lenses and as sunglasses. Eyeglasses.com offers vintage inspired glasses, sunglasses, reading glasses, and even computer glasses. Manufacturers of eyewear study and tweak vintage glasses design elements. Complete a vintage fashion look with vintage inspired glasses from Eyeglasses.com.